• Before you string up a single strand of lights, carefully check them for cracked cords, frayed ends or loose connections. • Modern lights have fused plugs, preventing sparks in case of a short circuit. Ditch old strands of lights that don’t have fuses and get a set of newer, safer lights.• The combination of shorts in electrical lights and a tinder-dry tree can be deadly. There are numerous Christmas tree fires and related deaths each year so keep your tree well-watered. Not only will it stay fresh and green, but it might also keep your house from burning down. • If bulbs have burned out, replace them right away, but make sure you use the correct wattage bulbs. • Water and debris can get into outdoor sockets, so make sure outdoor lights are plugged into a ground fault circuit interrupter outlet to reduce the risk of shorts and shocks. • Keep an eye on extension cords, as they can occasionally overheat. Just touch-test the cord. If it’s hot, unplug it. • Don’t use tacks, nails or screws to hang lights, which can pierce the cable and become electrified. Use insulated hooks instead. • When running extension cords along the ground, make sure to elevate plugs and connectors with a brick to keep snow, water and debris out of the connections. • Tape down any ground-level extensions cords to prevent people from tripping over them. • Check to make sure lights have been rated by Australian standards. • Not all lights are rated for outdoor use. Indoor lights often have thinner insulation, which which can become cracked and damaged when exposed to the elements outdoors. So make sure the ones you string up on the house belong out there. 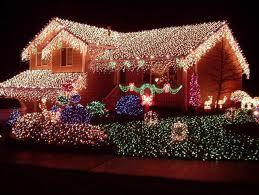 • Don’t leave Christmas lights running when you go to bed at night or when you leave the house. • When you put your lights back into storage after the holidays, make sure to put them in a well-sealed container to prevent possible water damage and to block hungry rodents looking to turn the cords into lunch. My final advice? Be careful with ladders.